A no-brainer to transparently restore any tone lost through long cable runs. Neat size. Great for restoring tone. 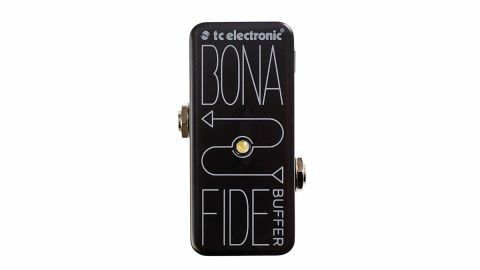 It has nothing to switch on and off and has no specific sound of its own, but the BonaFide Buffer is the same size as TC's mini pedals, slots into your pedalboard signal chain (it can even slip under your 'board if you want to save more space), and could transform your tone. The idea is to convert the high impedance signal coming from your guitar to low impedance to counteract any loss of top-end that long cable runs or a long chain of true bypass pedals could engender. The BonaFide features high-quality analogue buffering with a 112dB signal to noise ratio and has a cool power failure mode whereby it switches to true bypass if your power goes down. Our A/B testing showed that the BonaFide did not mess with our core tone, but restored top-end loss. It could really put some zing back into your signal that you may not even realise is missing.